But Really! I’m Conquering The World! For today, it’s a Pathfinder-compatible, super-cute-magical-cat-girl-sorceress-supervillainess. Why you say? Well actually for the usual reason: somebody asked. Besides, supervillainess super-cute magical cat girl… what’s to object to? If such a creature actually existed she could probably conquer quite a few places just by making appearances and waving at people. There are much much worse political leaders out there than someone who is a) competent, b) possessed of magical powers that they can teach to other people, c) female (and thus rather less likely to drag unwilling young women to their harem or suffer from a desire to posture menacingly), and d) apparently wishes to rule so that she can have lots of servants and parties without having to worry about the bills and because other people are less cute. You’d rather have Stalin, Pol Pot, or Kim Jong Un? In the usual fashion of comic-book magical types, this character is going to have to be unreasonably tough for a supposedly fairly “normal” person, somehow able to cast lengthy spells in the time it takes for a bullet to travel twenty feet, capable of powerful and broadly flexible magic within a rather limited set of themes yet almost useless otherwise and – preferably – should capable of coming back in some fashion if “killed”. They’re also going to need to be full of mysterious secrets; after all this is a supervillainess, a would-be world-conqueror, a sorceress, and a cat. At least three out of four of those call for it. Racial Package/Cute Catgirl (+0 ECL): +2 Charisma (12 CP), 1d4 Claws (3 CP), DR 2/- (3 CP), Occult Sense/Low-Light Vision (6 CP), Shaping (specialized in automatic cleaning, hair-brushing, clothing fixing, etc, 3 CP), +2 Reflex (6 CP), Speaks Feline (1 CP), Disadvantage/distinctive (obvious catgirl, -3 CP). The “League of Villainy” is, more or less, a union and clearing-house for Supervillains, allowing it’s members to readily find replacement henchmen, team up with other members, obtain supplies and gear for their schemes, and find appropriate archenemies. Members are obligated to adhere to an elaborate code of honor – notably restraining them from most attacks on civilians and the more obnoxious criminal offenses in favor of dramatic confrontations with heroes. Knocking out the guards and robbing banks is fine, murdering non-heroes and burning down orphanages is not. Privilege/Wealthy (3 CP). What self-respecting Supervillian would EVER be short of funds? Of course, as a minor privilege… this covers having a mansion, servants, and a very enjoyable lifestyle, but not a lot of extra adventuring gear. That stuff is REALLY expensive. Lynxi’s personal enhancements are Shield (2000), Personal-Only Mage Armor (1400), Personal-Only Immortal Vigor I (1400), Fast Healing I (up to a limit of 36 points per day, 400), Personal-Only Inspiring Word (1400 GP), and Undetectable Alignment 2/Day (400 GP). Actually this is pretty much a copy-and-paste deal from Baron Ector, also a not-quite-serious supervillain (And who would make a GREAT partner for her). Still it fits – and is one of the handier features of Eclipse; you see something you like in another Eclipse character? Just copy-and-paste, pay the points, and now it’s yours! Prior “Lives”: +3 Specialty in each of three times and places where the character “previously lived” (3 CP). Memory of Stone: Immunity/Forgetting Things and Memory Alteration (Uncommon, Minor, Great, 6 CP). +8 bonus to Recall. Occult Skill/Secrets (3 CP): Each skill point invested in the “Secrets” skill brings extraordinary knowledge – the names of a dozen powerful fey, the routes through the crypts beneath the sacred mountains, or the summoning chant of the three winds. The game master may let a character roll against his or her Secrets skill to see if they know some bit of lost information – or simply give the user additional secrets/plot hooks when it’s convenient. Rune Weaver: Gain the Magician (6 CP), Runic Ritual (6 CP), and Adept (twice) abilities – although the second instance of Adept is Specialized/two skills only (9 CP). Each Ancient One gets three Rune Casting and Rune Mastery skills for half price. Past Master: +8 to their primary spellcasting attribute for magical purposes (in general, for learning and casting spells and for bonuses to magical skills), Corrupted/does not increase save DC, Specialized/only affects bonus slots and skill scores for Rune Magic, not for other spellcasting and magic-related skills (8 CP). Long Experience: Augmented Bonus/add (Wis Mod) to (Int Mod) with respect to their Knowledge Skill Scores (6 CP). The Deep Lore/+4 to all six of their core magical skills (12 CP), +3 to Secrets (3 CP), +3 to a Martial Art (3 CP), +3 to Linguistics (the languages of previous “lives”, 3 CP), and +3 to any two other skills (6 CP). Template Disadvantages: History (Where is your memory talisman located? What are you doing to look after it? Who were you in your earlier lives, how did those memories wind up in a talisman, and what were those lives like? Playing an Ancient One involves coming up with a fair amount of information), Hunted (the Ancient Ones always have enemies), and Insane (Ancient Ones act pretty oddly, tend to upset people, never forget an injury or offense, and are often so weird that they’re believed possessed) (-10 CP). Fast Learner, Specialized and Corrupted/only works as long as she sticks to her “sorceress” build, points may only be spent on skills and additional hit points (2 CP). (Yes, this is the Pathfinder “Favored Class” bonus). Action Hero/ Crafting option, Specialized and Corrupted/the user still has to spend the time, and money, and may ONLY create items by spending action points (2 CP). +3 Bonus to “Trained In-Class Skills”. Craft, Profession, and a selection of twelve. “Adept” skills are added automatically. Accursed (must use the Pathfinder versions of spells even where those have been downgraded, may not take “overpowered” feats, -3 CP). The Ancient One template makes for some awfully formidable low-level Rune Mages. As a skill-based magic system, that effective +8 to their three primary thematic fields of magic provides +4 casting levels and +2 on the level of spells they can use – and they’re bound to get plenty of bonus spells too. They ARE using the half-price attribute rule, but they’re still pretty formidable even if the game master drops it to a mere +4 for a game that isn’t using that rule. Later on, of course, their limited spell supply and slower spell level progression will catch up with them – but at least they’ll have more points to spend on other things than a sorcerer or a wizard. Basic Attributes; Str 8, Int 14, Wis 10, Dex 14 (16), Con 12, Chr 20 (22, Headband) (30 for Rune Magic Purposes). Languages: Common, Feline, +2 additional. Hit Points: 12 (L1d12, 8 CP) +15 (L2-L4, d6, 5, 5, 5, 6 CP) +12 (Im. Vigor) + 6 (6 x Con Mod) = 45. Universal DR 5/-. Skill Points: 10 (10 CP) +14 (Int) +14 (Fast Learner) = 38. AC: 10 +4 (Armor) +4 (Shield) +3 (Dex) +1 (MA) = 22. Claws: +2 (+2 BAB -1 Str +1 Mor), 1d4-1+1 (Str and Morale), Crit 20/x2. Grant of Aid with +4 Bonus Uses, Specialized in hit points for Double Effect (12 CP). Reflex Training/Three Action Per Day Variant (6 CP). Leadership with Beast Lord (9 CP) – probably some big cat bodyguards, a few servants, and other minions. Even if we go by ECL instead of level (which is fair enough for a Pathfinder type), there aren’t going to be all that powerful or numerous yet even with that high Charisma. Companion (Hawk Familiar) with the Spirit Fetch Template (12 CP). Bestowed Ability: Mindspeech and Spirit Speech, Specialized/only for communication with spirits. Occult Sense/Spirit Sense, may see and hear spirits (6 CP). After all, cats (and dogs) are ALWAYS seeing and hearing things that you aren’t. Adept (Acrobatics, Sleight of Hand, Spellcraft, Stealth, 6 CP). 2d6 Mana, Corrupted/only to power Rune Magic, no natural magic (8 CP). Rite of Chi with +4 Bonus Uses (8 CP), Corrupted/requires the use of an especially-crafted staff in a small ceremony. Rune Magic/Casting (Binding, Conjuration, Transmutation): +3 (Tr) +10 (Cha) +4 (2 SP*, 6 total) +4 (Race) = +21 (CL 10). Rune Magic/Mastery (Binding, Conjuration, Transmutation): +3 (Tr) +10 (Cha) +4 (2 SP*, 6 total) +4 (Race) = +21 (Max L5). Magician provides 3/3/2/2/2/2/1/1/1 spell slots to work with, although she cannot yet use those of above level five. Acrobatics: +3 (Tr) +3 (Dex) +4 (2 SP*) +3 (Race) = +13 (17 with Belt). Known Techniques (7); Defenses 1, Toughness 3, Deflect Arrows, Instant Stand, Inner Strength, and Light Foot. All skill checks also gain a +1 Morale Bonus. Three “Past Lives”: +3 (Racial). Agile Alpenstock (2000 GP): +5 Speed, +2 versus Tripping, as per a Quarterstave. Belt of Tumbling (800 GP: +4 Acrobatics. Boots of the Cat (1000 GP): Minimal damage from falls, always land on your feet. Headband of Allurement (4000 GP): +2 Charisma. Ioun Torch (75 GP): Provides light. Ring of Sustenance (2500 GP): Needs no food or water and less sleep. This doesn’t STOP her – she just doesn’t HAVE too. This leaves about 625 GP for mundane gear and 5000 GP for more magic. Pick something. 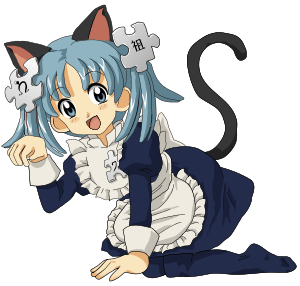 It also leaves her with 4 CP from her “Favored Class” bonus to be spent on something – nominally either hit points or as more skill points, but you can always pick some specialized cat-girl bonus. OK; Lynxi is actually pretty formidable – tough enough, and with enough normal and summoned minions to be low-level “boss” encounter – but she’s also perfectly suitable as an adventurer. It’s not like wanting to grab all the money and rule the world isn’t the basic motive of half the adventurer’s out there anyway. In a campaign… she’ll probably eventually find out that – despite her initial advantages as a Rune Mage – she’s really just not cut out to actually rule the world. Not, at least, without a powerful partner.